Since over 30 years ago first fiber optic data cable have been installed and applied, now, with the improvement of fiber optic technique and also considering competitive cost of the complete range of optic devices, our Fiber Optic Solution surely fulfill the high speed data network & telecommunication requirements. 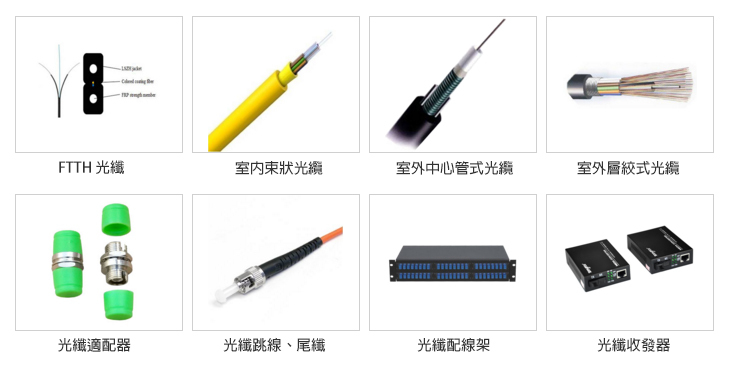 Fiber optic cabling product line includes indoor and outdoor fiber optic cable, fiber optic cable network equipment, fiber optic connector assemblies and fiber optic wiring and hardware management system. The combination of these products, can help users implement a local area network (LAN), wide area network (WAN), fiber to the home (FTTH), fiber to the desktop (FTTD) and other network applications. Made by the most common substance, silicon dioxide (SiO2), in complete core diameter 9um – single mode, 62.5um – OM1, 50um – OM2/OM3, and with 125um refraction cladding, to afford light signal transmission supports long distance and high speed data network & telecommunication. To use the light to transmit the signals from one place to another place over optic fiber, is due to the light propagates through the fiber with little attenuation also immune to electromagnetic interference. These advantages also contribute to fiber optic development and practical application. In most classical premise cabling, SM or MM fiber optic cables more are used as backbone cabling. They convert the optical signals to electrical signals to the end subscriber through the corresponding copper communication cables. LAN cables also will be used for distances over 100 meters, which are not avaiable for copper cables. Regarding to the pure fiber optic cabling system, with the PON- passive optical network system develop, like IEEE E-PON, ITU G-PON, the one point to multipoint network. Also the extension base on above systems and protocol comes with FTTX applications which depend on the ONU location. Top Network LAN fiber optic systems provides different type cables to fulfill these fiber optic solutions, especially the FTTH cable series, with customer’s choice on normal G652D fibers, or G657A low bending loss fiber for complex corner-bending situation. KNS is capable to provide you all types’ high quality and reliable fiber optic cables. KNS solution includes a full range of optic devices, fiber optic cables, and also the accessories like pigtails, patch cords, adapters and different type’s terminal boxes. Top Network has complete ranges of these components with low attenuation loss control, combines with fiber optic cables, support the complete channel with good headroom margin.